Spring is the pinnacle time of year in South Florida. It starts out with spring break, then moves seamlessly into Miami Music Week and Ultra, MLB Spring Training, and further on into Memorial Day, when we all plan where we’re going to go to get the hell out of town. These are our last few months of perfect weather before the steam bath of summer rolls in, so best to make the most of it. Here are the events you’ll want to hit across South Florida this season. One of the flat-out funniest bands to see live is performing in a small space with an open bar when this classic '90s Canadian group comes to Bleaulive. The international dining sensation Diner en Blanc returns to... somewhere in Miami. Dress in white, pack a picnic basket, and enjoy one of Miami’s most beautiful public spaces when the venue is released just before the dinner. Last year’s locations were Soundscape Park and the Design District Palm Court. The most Miami spectator sport of the year hits South Beach when models from the city’s top agencies square off in a daylong tournament where absolutely nobody cares who wins. Not only will some of the city’s best chefs be competing to see who can make the best Cuban at this year’s Calle Ocho Festival, the sixth annual Cuban Sandwich Smackdown will also see people attempting to set the record for the world’s largest Cuban Sandwich at 128ft. USA Amateur boxing national champion Alvin Davie from THE BOX will be teaching a one-night-only moonlit boxing class under a full moon from 7-8pm. See if you can keep from getting a shiner. This is your year to finally hit up the fastest-growing jazz and R&B festival in the nation, when LL Cool J, The Roots, Jill Scott, and Common headline Jazz in the Gardens. Celebrate the greatest constitutional amendment in Florida history when Trick, Grind Mode, and Telekinetic Walrus perform at the Medical Marijuana Benefit Concert from 4:20pm-3am. Miami’s top chefs will be cooking for you as you mingle with tennis greats past and present at the Citi Taste of Tennis. All this while taking in the spectacular view from the 50th floor of the W Miami. The largest non-slam tournament of the tour makes its annual stop in our island paradise, when the ATP and WTA’s best duke it out at the Miami Open. Paula DaSilva, Timon Balloo, and Jeremiah Bullfrog will be among 10 chefs showing what they can do with a heritage breed pig, showcasing worldwide barbecues styles and paring it all with fine wines and cocktails. Project Runway judge Nina García will host a Nicole Miller runway show of her lauded Spring 2017 collection, and emerging designers from both New York and South Florida will be showcasing their creations with plenty of parties to boot, all at the Lauderdale Underground Fashion Weekend. Even if you don’t know a trifecta from a triceratops, you can still enjoy the spectacle of Florida’s most prestigious horse race. The derby is often a tune-up for the Triple Crown for the world’s best thoroughbreds, and the perfect time to introduce yourself to the sport of kings. The first annual Ft. Lauderdale Pizza festival will feature over 120 pie slingers from around South Florida, as well as lawn games, wine tents, and of course, plenty of beer. Local favorites like Funky Buddha and J Wakefield will be sampling suds next to the likes of Sam Adams, New Belgium, and 300 others as Miami’s most raucous spring beer festival takes its act to Wynwood. Miami’s biggest barbecue festival is back for its third year, where the day kicks off with a Yappy Hour for dogs and continues on with beer, barbecue, and cooking demos until 7pm. Fat Joe and the ubiquitous DJ Irie join Chef James to help celebrate the 30th anniversary (yep, it's 30) of Bayside Marketplace at this festival of Latin American culture. Doral continues to grow up right in front of our eyes, and finally gets its own bowling alley with better food than a lukewarm hotdog. Kings Bowling opens its doors with a chic cocktail lounge and the first 250 people through the door bowl free for a year! 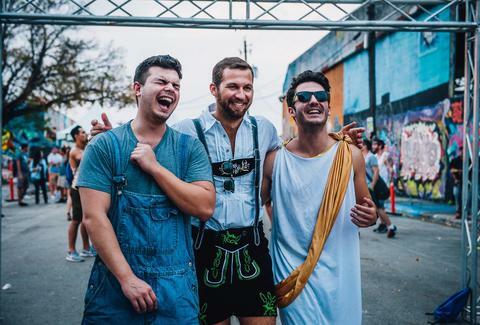 Wynwood’s biggest street party celebrates one of the last tolerable weekends to be outside at Wynwood Life. Chefs and artists share the street and 20 local bands hit the stage for three days. Palm Beach County’s rowdiest boat party of the year goes down on the waters of Lake Boca. Even if all you’ve got is an inflatable kayak, tie up next to the big boys and join in the insanity, as long as you bring beer for everyone. Life sized LEGO incarnations of your favorite super heroes will be on display for the first time in Florida for two weeks at the Gardens Mall in Palm Beach Gardens. See the Batman, Wonder Woman, and Captain America statuettes that contain over 50,000 bricks EACH. A cake and candy expo sounds a little like a place you’d need a golden ticket to enter, but for one weekend only the SoFlo Cake & Candy Expo lets everyone in to see the latest and greatest in home and professional baking innovations. You ever wonder who those people are driving next to you in bright orange Cadillacs that seem to be riding about an inch off the pavement? Meet them and learn about their entire subculture at this weekend-long festival that also boasts a tattoo expo and barber battle. Childhood meets full-on adulthood at this celebration of shredded fried potatoes and beers. Sample about eight different types of gourmet tater tots while sipping beers from dozens of local and international breweries. If you’ve never been to South Florida’s best all-around music festival, now’s the year to go. Blink-182 makes a return to South Florida along with Snoop Dogg, Marshmello, and 50 other bands on three stages over five days. While every bar, restaurant, and pop-up taco stand will be celebrating Cinco de Mayo with probably-too-many-margs, do something different and hit up Wynwood Yard at 8:30pm for a special performance by Grateful Dead tribute band, Unlimited Devotion. Taste of the Nation, the year’s biggest annual culinary benefit, returns from 7-10pm, where chefs from Byblos, KYU, Scarpetta, and pretty much every restaurant you love dole out samples with proceeds going to the No Kid Hungry campaign. The Miami Symphony Orchestra pops up in Palm Court Plaza for a free concert open to the public to enjoy an evening of exceptional live music. Though we’re lucky to have no shortage of great Haitian food in Miami, nowhere will you find it in greater abundance than at this annual festival. In addition to showcasing the best Haitian chefs in the city, Taste of Haiti also has live music, dancing, and colorful Haitian art. MUSE sells out Wembley stadium in 10 minutes. But in South Florida, good seats will definitely be available for the most spectacular show in rock today. Added bonus: 30 Seconds to Mars is the opening act. Matt Meltzer is a contributing writer for Thrillist who already has way too many selfies with LEGO Batman. See them all on Instagram @meltrez1.